Betsey's ancestry can be seen on her father Jonathan Martin's page. * Sometimes Travis. The family name originally appears to have been Travis. 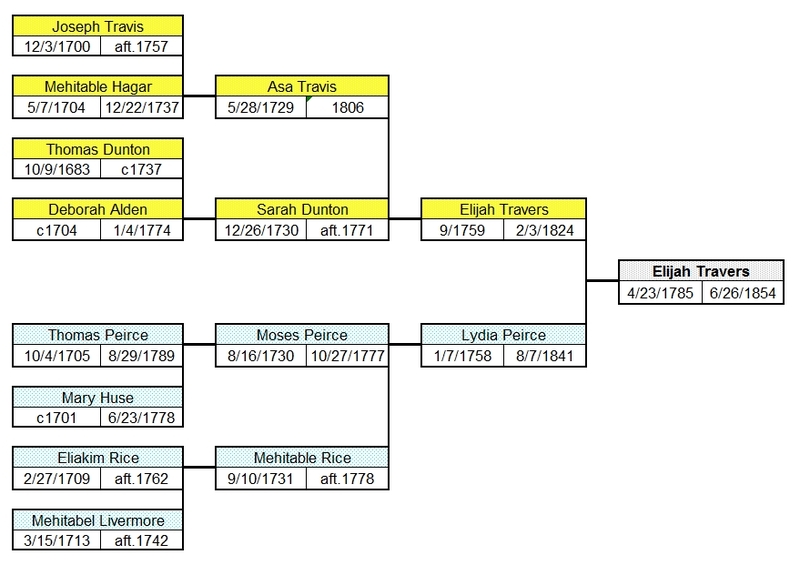 Descendants of Elijah Travers, including sons George M and Charles S.
1. ELIJAH7 TRAVERS/TRAVIS (ELIJAH6, ASA5 TRAVIS, JOSEPH4, JAMES3, JAMES2, HENRY1) was born 23 Apr 1785 in Weston MA, and died 26 Jun 1854 in Gardner MA. He married BETSEY MARTIN 26 Oct 1807 in int Gardner MA, daughter of JONATHAN MARTIN and SUSANNA TAYLOR. She was born 17 Feb 1789 in Middleboro/Lunenburg MA, and died 22 Nov 1870 in Gardner MA. 2. i. GEORGE MARTIN8 TRAVERSE, b. 05 Sep 1809, Middleborough MA; d. 25 Jul 1900, Concord NH. 3. ii. LYDIA PIERCE TRAVERS, b. 12 Jan 1812, Middleborough MA; d. 02 Jan 1892, Gardner MA. 4. iii. CHARLES SUMNER TRAVERS, b. 26 Feb 1814, Gardner MA; d. 15 Jul 1866, Boston MA. 5. iv. FIDELIA WATERMAN TRAVERS, b. 12 Nov 1816, Gardner MA; d. 12 Aug 1844, Gardner MA. 6. v. BETSEY L L TRAVERS, b. 11 Jan 1819, Gardner MA; d. 31 Oct 1855, Gardner MA. vi. SARAH S TRAVERS, b. 26 Feb 1822, Gardner MA. vii. HORACE P TRAVERS, b. 01 Dec 1824, Gardner MA. 7. viii. ELIJAH CLEMENT TRAVERS, b. 21 Sep 1826, Gardner MA; d. 30 Apr 1905, Gardner MA. ix. OTIS A TRAVERS/TRAVIS, b. 06 Dec 1829, Gardner MA; d. 16 Apr 1875, Gardner MA. 2. GEORGE MARTIN8 TRAVERSE (ELIJAH7 TRAVERS/TRAVIS, ELIJAH6, ASA5 TRAVIS, JOSEPH4, JAMES3, JAMES2, HENRY1) was born 05 Sep 1809 in Middleborough MA, and died 25 Jul 1900 in Concord NH. He married MARTHA LEARNED 04 Jul 1832 in Gardner MA, daughter of SAMUEL LEARNED and LYDIA KNAPP. She was born 12 Apr 1811 in Gardner MA, and died 06 Nov 1891 in Gardner MA. 8. i. MARTHA E9 TRAVERS, b. 15 Jan 1833, Gardner MA; d. Aft. 1910. 9. ii. MARY FRANCES TRAVERS, b. 26 Feb 1842, Gardner MA; d. 09 Aug 1889, Gardner MA. 3. LYDIA PIERCE8 TRAVERS (ELIJAH7 TRAVERS/TRAVIS, ELIJAH6, ASA5 TRAVIS, JOSEPH4, JAMES3, JAMES2, HENRY1) was born 12 Jan 1812 in Middleborough MA, and died 02 Jan 1892 in Gardner MA. She married DAVID PARKER BICKFORD 03 Jun 1839 in Brattleboro VT, son of EBENEZER BICKFORD and SARAH HILL. He was born Abt. 23 May 1819 in Gardner MA, and died 11 Jul 1876 in Gardner MA. i. HORACE PARKER9 BICKFORD, b. 23 May 1840, Gardner MA; d. 19 Apr 1846, Gardner MA. ii. MARY A BICKFORD, b. Abt. 1843; d. 09 Dec 1862, Gardner MA. 10. iii. CLARA J BICKFORD, b. 06 Apr 1845, Gardner MA; d. Bet. 1900 - 1910. 11. iv. HORACE C H BICKFORD, b. 05 Jan 1848, Gardner MA; d. 1928.
v. DAVID BICKFORD, b. 22 Jul 1850, Gardner MA; d. 24 Jul 1850, Gardner MA. 12. vi. IMOGENE F BICKFORD, b. 25 Sep 1851, Gardner MA; d. 1933. 4. CHARLES SUMNER8 TRAVERS (ELIJAH7 TRAVERS/TRAVIS, ELIJAH6, ASA5 TRAVIS, JOSEPH4, JAMES3, JAMES2, HENRY1) was born 26 Feb 1814 in Gardner MA, and died 15 Jul 1866 in Boston MA. He married (1) ROXA BAKER 21 Sep 1838 in int Gardner MA, daughter of GEORGE BAKER and OLIVE HOLDEN. She was born 09 Oct 1821 in Gardner MA, and died 12 Feb 1847 in Gardner MA. He married (2) SARAH JANE DAY 25 Jul 1849 in Fitchburg MA, daughter of MOSES DAY and PAMELIA SAWTELL. She was born Abt. 1821 in MA, and died 18 Jan 1851 in Gardner MA. He married (3) SARAH P HIGGINS 02 Jul 1859 in Boston MA, daughter of NATHANIEL HIGGINS and REBECCA ?. i. CHARLES SUMNER9 TRAVERS, b. 01 Nov 1841, Gardner MA; d. 14 May 1889, Gardner MA; m. HARRIET J POSTE, 17 Feb 1884, Potsdam NY; b. 07 Jan 1856, Potsdam NY; d. 04 Apr 1895.
ii. ROXA JANE TRAVERS, b. 21 Jul 1846, Gardner MA; d. Aft. 1900; m. JOHN W ROBINSON, 01 Oct 1868, Gardner MA; b. Abt. 1844; d. Bef. 1900.
iii. GEORGE F9 TRAVERS, b. Abt. 1850, Gardner MA; d. 01 Oct 1850, Gardner MA. 5. FIDELIA WATERMAN8 TRAVERS (ELIJAH7 TRAVERS/TRAVIS, ELIJAH6, ASA5 TRAVIS, JOSEPH4, JAMES3, JAMES2, HENRY1) was born 12 Nov 1816 in Gardner MA, and died 12 Aug 1844 in Gardner MA. She married RANSOM BOLTON 08 Feb 1838 in Gardner MA, son of EBENEZER BOLTON and LENDAY LELAND. He was born 02 May 1817 in Gardner MA, and died 06 Oct 1844 in Gardner MA. 13. i. VICTORIA A9 BOLTON, b. Apr 1841, MA; d. Aft. 1910. 6. BETSEY L L8 TRAVERS (ELIJAH7 TRAVERS/TRAVIS, ELIJAH6, ASA5 TRAVIS, JOSEPH4, JAMES3, JAMES2, HENRY1) was born 11 Jan 1819 in Gardner MA, and died 31 Oct 1855 in Gardner MA. She married WERDEN ADAMS HOWE 12 Nov 1846 in Gardner MA, son of JAMES HOWE and PHEBE BRIGGS. He was born Mar 1827 in Jamaica VT, and died 14 Jan 1907 in Erving MA. i. LIZZIE MELISSA9 HOWE, b. 31 Aug 1855, Gardner MA. 7. ELIJAH CLEMENT8 TRAVERS (ELIJAH7 TRAVERS/TRAVIS, ELIJAH6, ASA5 TRAVIS, JOSEPH4, JAMES3, JAMES2, HENRY1) was born 21 Sep 1826 in Gardner MA, and died 30 Apr 1905 in Gardner MA. He married DIANTHA A WILLIAMS 05 Sep 1856 in Gardner MA, daughter of LEWIS WILLIAMS and PATTY ?. She was born 29 Nov 1837 in Winhall VT, and died 1936.
i. ADDIE MARIA9 TRAVERS, b. 26 Nov 1857, Gardner MA; d. 29 Mar 1861, Winhall VT.
ii. CARRIE LUCRETIA TRAVERS, b. 02 Oct 1859, Gardner MA; d. 14 Jun 1885, Gardner MA. 14. iii. LEWIS CLEMENT TRAVERS, b. 01 Sep 1861, Gardner MA; d. 1951. 15. iv. WILLIAM HENRY TRAVERS, b. 17 Jun 1871, Gardner MA; d. 1953. 8. MARTHA E9 TRAVERS (GEORGE MARTIN8 TRAVERSE, ELIJAH7 TRAVERS/TRAVIS, ELIJAH6, ASA5 TRAVIS, JOSEPH4, JAMES3, JAMES2, HENRY1) was born 15 Jan 1833 in Gardner MA, and died Aft. 1910. She married WILLIAM B DURGIN 24 Sep 1854 in Boston MA. He was born Jul 1833 in NH, and died Bet. 1900 - 1910. 16. i. GEORGE F10 DURGIN, b. Apr 1856, NH; d. 07 May 1905, Concord NH. 17. ii. MARY SUSAN DURGIN, b. Abt. 1864, Concord NH; d. 24 Jan 1895, Providence RI. 9. MARY FRANCES9 TRAVERS (GEORGE MARTIN8 TRAVERSE, ELIJAH7 TRAVERS/TRAVIS, ELIJAH6, ASA5 TRAVIS, JOSEPH4, JAMES3, JAMES2, HENRY1) was born 26 Feb 1842 in Gardner MA, and died 09 Aug 1889 in Gardner MA. She married HORACE FLETCHER PARKER 10 Jan 1865 in Gardner MA, son of DAVID PARKER and ELIZA SAWIN. He was born 13 Aug 1839 in Gardner MA, and died Aft. 1920.
i. MARY ELIZA10 PARKER, b. 24 Apr 1867, Gardner MA; d. Aft. 1880. 10. CLARA J9 BICKFORD (LYDIA PIERCE8 TRAVERS, ELIJAH7 TRAVERS/TRAVIS, ELIJAH6, ASA5 TRAVIS, JOSEPH4, JAMES3, JAMES2, HENRY1) was born 06 Apr 1845 in Gardner MA, and died Bet. 1900 - 1910. She married GEORGE A LEARNED 05 Oct 1870 in Gardner/Templeton MA, son of JOSHUA LEARNED and HARRIET KNIGHT. He was born Oct 1849 in NY, and died 15 Oct 1917 in Greenfield MI. 18. i. CHARLES ARCHIE10 LEARNED, b. 02 Apr 1872, Gardner MA; d. Bet. 1910 - 1920. 19. ii. GEORGE H LEARNED, b. Jul 1874, MA; d. Aft. 1930. 20. iii. MARY M LEARNED, b. 28 Aug 1876, Fort Atkinson WI; d. Aft. 1940. 21. iv. FRANK KNIGHT LEARNED, b. 24 Jul 1878, Gardner MA; d. 23 Mar 1944, Los Angeles CA. 22. v. BERTHA E LEARNED, b. Oct 1882, MA; d. Aft. 1940. 23. vi. WALTER IRVING LEARNED, b. 23 Feb 1885, MA; d. Aft. 1930. 24. vii. CLARA H LEARNED, b. Oct 1887, MI; d. Aft. 1940.
viii. JESSIE GLADYS LEARNED, b. Aug 1890, MI; d. Aft. 1915; m. SIDNEY ESSIE GOODMAN, 26 Oct 1915, Detroit MI; b. 12 Oct 1885, Detroit MI; d. Aft. 1917. 11. HORACE C H9 BICKFORD (LYDIA PIERCE8 TRAVERS, ELIJAH7 TRAVERS/TRAVIS, ELIJAH6, ASA5 TRAVIS, JOSEPH4, JAMES3, JAMES2, HENRY1) was born 05 Jan 1848 in Gardner MA, and died 1928. He married CHARLOTTE A SAUNDERS 16 Jan 1872 in Athol MA, daughter of BENJAMIN SAUNDERS and ALICE BARRETT. She was born Abt. 1842 in Westminster MA, and died 1926.
i. HATTIE E10 BICKFORD, b. Abt. 1876, Fort Atkinson WI; d. 28 Dec 1876, Gardner MA. 12. IMOGENE F9 BICKFORD (LYDIA PIERCE8 TRAVERS, ELIJAH7 TRAVERS/TRAVIS, ELIJAH6, ASA5 TRAVIS, JOSEPH4, JAMES3, JAMES2, HENRY1) was born 25 Sep 1851 in Gardner MA, and died 1933. She married MOSES EMERSON CREED 01 Aug 1876 in Gardner MA [7/28/1876 Hubbardston MA], son of MOSES CREED and BELINDA SMITH. He was born 21 May 1849 in Leominster MA, and died 1927.
i. ALBERT FRANCIS10 CREED, b. 07 Dec 1883, Gardner MA; d. 07 Oct 1887, Gardner MA. ii. HORACE EMERSON CREED, b. 25 May 1887, Gardner MA; d. Aft. 1942; m. GERTRUDE J CASAVANT; b. Abt. 1889, MA; d. Aft. 1940.
iii. WALTER FRANCIS CREED, b. 05 Oct 1890, Gardner MA; d. 1949. 13. VICTORIA A9 BOLTON (FIDELIA WATERMAN8 TRAVERS, ELIJAH7 TRAVERS/TRAVIS, ELIJAH6, ASA5 TRAVIS, JOSEPH4, JAMES3, JAMES2, HENRY1) was born Apr 1841 in MA, and died Aft. 1910. She married EDWARD EUGENE RICHARDSON 01 Oct 1868 in Worcester MA, son of EDWARD RICHARDSON and MARY ?. He was born 23 Oct 1845 in Holden MA, and died Aft. 1910. 25. i. EDITH A10 RICHARDSON, b. 29 Apr 1869, Worcester MA; d. Aft. 1930. 26. ii. ELMER EUGENE RICHARDSON, b. 29 Jun 1872, Worcester MA; d. Aft. 1920. 27. iii. WALTER H RICHARDSON, b. Abt. 1874, Holden MA; d. Aft. 1940. 14. LEWIS CLEMENT9 TRAVERS (ELIJAH CLEMENT8, ELIJAH7 TRAVERS/TRAVIS, ELIJAH6, ASA5 TRAVIS, JOSEPH4, JAMES3, JAMES2, HENRY1) was born 01 Sep 1861 in Gardner MA, and died 1951. He married FLORENCE M CLARK, daughter of JAMES CLARK and LUCY NICHOLS. She was born 03 Sep 1862 in Westminster MA, and died 1939.
i. ALAN L10 TRAVERS, b. 1890; d. 1895. 15. WILLIAM HENRY9 TRAVERS (ELIJAH CLEMENT8, ELIJAH7 TRAVERS/TRAVIS, ELIJAH6, ASA5 TRAVIS, JOSEPH4, JAMES3, JAMES2, HENRY1) was born 17 Jun 1871 in Gardner MA, and died 1953. He married MAUDE LEE COSSABOOM Abt. 1893, daughter of WILLIAM COSSABOOM and PAULINA HINES. She was born Sep 1874 in Nova Scotia, and died 1961. 28. i. PAULINE DIANTHA10 TRAVERS, b. 03 May 1894, Gardner MA; d. 08 Mar 1983, Gardner MA. ii. PHYLLIS MAUDE TRAVERS, b. 31 Dec 1895, Gardner MA; d. 05 Nov 1986, Gardner MA; m. WILLIAM SALSBURY LUCKENBACH; b. 03 Jul 1903, NJ; d. 12 Feb 1993, Gardner MA. iii. LOUISE TRAVERS, b. 03 Dec 1897, Gardner MA; d. 24 Sep 1980, Gardner MA. 16. GEORGE F10 DURGIN (MARTHA E9 TRAVERS, GEORGE MARTIN8 TRAVERSE, ELIJAH7 TRAVERS/TRAVIS, ELIJAH6, ASA5 TRAVIS, JOSEPH4, JAMES3, JAMES2, HENRY1) was born Apr 1856 in NH, and died 07 May 1905 in Concord NH. He married BLANCHE H BELLOWS 06 Feb 1883 in Boston MA. She was born Nov 1863 in NH, and died Aft. 1900. 29. i. GLADYS BELLOWS11 DURGIN, b. 03 Jun 1884, Concord NH; d. 09 Jan 1980, Humbolt CA. 17. MARY SUSAN10 DURGIN (MARTHA E9 TRAVERS, GEORGE MARTIN8 TRAVERSE, ELIJAH7 TRAVERS/TRAVIS, ELIJAH6, ASA5 TRAVIS, JOSEPH4, JAMES3, JAMES2, HENRY1) was born Abt. 1864 in Concord NH, and died 24 Jan 1895 in Providence RI. She married RICHARD HENRY RICE 06 Apr 1887 in Concord NH. He was born 09 Jan 1863 in Rockland ME, and died Aft. 1920. 30. i. PHYLLIS11 RICE, b. 02 Apr 1889, Cambridge MA; d. Aft. 1940.
ii. RICHARD DRURY RICE, b. 29 Jun 1891, Providence RI; d. Aft. 1920.
iii. SUSAN D RICE, b. Jan 1895, RI; d. Aft. 1920; m. ROBERT L NORTHROP; b. Abt. 1896, IL; d. Aft. 1920. 18. CHARLES ARCHIE10 LEARNED (CLARA J9 BICKFORD, LYDIA PIERCE8 TRAVERS, ELIJAH7 TRAVERS/TRAVIS, ELIJAH6, ASA5 TRAVIS, JOSEPH4, JAMES3, JAMES2, HENRY1) was born 02 Apr 1872 in Gardner MA, and died Bet. 1910 - 1920. He married MARGARET KOHLER 14 Jun 1905 in Detroit MI. She was born Abt. 1874 in WI, and died Aft. 1920.
i. MARGARET RUTH11 LEARNED, b. Abt. 1908, MI; d. Aft. 1930; m. JOSEPH NOVAK; b. Abt. 1896, PA; d. Aft. 1930.
ii. ELEANOR LEARNED, b. Abt. 1913, MI; d. Aft. 1930. 19. GEORGE H10 LEARNED (CLARA J9 BICKFORD, LYDIA PIERCE8 TRAVERS, ELIJAH7 TRAVERS/TRAVIS, ELIJAH6, ASA5 TRAVIS, JOSEPH4, JAMES3, JAMES2, HENRY1) was born Jul 1874 in MA, and died Aft. 1930. He married MILDRED AMELIA DONOVAN 01 Oct 1908 in Detroit MI. She was born Abt. 1877 in MI, and died Aft. 1930.
i. GEORGE D11 LEARNED, b. Abt. 1910, MI; d. Aft. 1930.
ii. JOSEPH C LEARNED, b. Abt. 1914, MI; d. Aft. 1930. 20. MARY M10 LEARNED (CLARA J9 BICKFORD, LYDIA PIERCE8 TRAVERS, ELIJAH7 TRAVERS/TRAVIS, ELIJAH6, ASA5 TRAVIS, JOSEPH4, JAMES3, JAMES2, HENRY1) was born 28 Aug 1876 in Fort Atkinson WI, and died Aft. 1940. She married DEAN S GRAY 14 Aug 1901 in Detroit MI. He was born Abt. 1872 in MI, and died Aft. 1940.
i. LYMAN GEORGE11 GRAY, b. 09 Nov 1902, Detroit MI; d. Aft. 1940; m. HELEN L BRIEDEN, 25 Feb 1928, Wood OH; b. Abt. 1903, MI; d. Aft. 1940. 21. FRANK KNIGHT10 LEARNED (CLARA J9 BICKFORD, LYDIA PIERCE8 TRAVERS, ELIJAH7 TRAVERS/TRAVIS, ELIJAH6, ASA5 TRAVIS, JOSEPH4, JAMES3, JAMES2, HENRY1) was born 24 Jul 1878 in Gardner MA, and died 23 Mar 1944 in Los Angeles CA. He married (1) HARRIET E COVERT 19 Jun 1902 in Owosso MI. He married (2) CATHERINE MYERS 18 Dec 1905 in Kalamazoo MI. She was born Abt. 1884 in MI, and died Aft. 1940.
i. CATHERINE H11 LEARNED, b. Abt. 1908, MI; d. Aft. 1930.
ii. JULIA P LEARNED, b. Abt. 1909, MI; d. Aft. 1930.
iii. FRANCES K LEARNED, b. Abt. 1913, MI; d. Aft. 1930.
iv. FRANK K LEARNED, b. Abt. 1915, MI; d. Aft. 1930. 22. BERTHA E10 LEARNED (CLARA J9 BICKFORD, LYDIA PIERCE8 TRAVERS, ELIJAH7 TRAVERS/TRAVIS, ELIJAH6, ASA5 TRAVIS, JOSEPH4, JAMES3, JAMES2, HENRY1) was born Oct 1882 in MA, and died Aft. 1940. She married ARCHIBALD KERR 14 Feb 1906 in Detroit MI. He was born Abt. 1860 in Canada, and died Bet. 1930 - 1940.
i. DONALD A11 KERR, b. Abt. 1909, MI; d. Aft. 1930.
ii. RICHARD L KERR, b. Abt. 1911, MI; d. Aft. 1940.
iii. FREDERICK W KERR, b. Abt. 1913, MI; d. Aft. 1930.
iv. KENNETH A KERR, b. Abt. 1915, MI; d. Aft. 1940. 23. WALTER IRVING10 LEARNED (CLARA J9 BICKFORD, LYDIA PIERCE8 TRAVERS, ELIJAH7 TRAVERS/TRAVIS, ELIJAH6, ASA5 TRAVIS, JOSEPH4, JAMES3, JAMES2, HENRY1) was born 23 Feb 1885 in MA, and died Aft. 1930. He married ANNA BELLE MACKAY 24 Feb 1909 in Detroit MI. She was born Abt. 1886 in MI, and died Aft. 1930.
i. WALTER H11 LEARNED, b. Abt. 1916, OH; d. Aft. 1930.
ii. SON LEARNED, b. 24 May 1917, Akron OH; d. 24 May 1917, Akron OH. iii. ELLEN J LEARNED, b. Abt. 1927, OH; d. Aft. 1930. 24. CLARA H10 LEARNED (CLARA J9 BICKFORD, LYDIA PIERCE8 TRAVERS, ELIJAH7 TRAVERS/TRAVIS, ELIJAH6, ASA5 TRAVIS, JOSEPH4, JAMES3, JAMES2, HENRY1) was born Oct 1887 in MI, and died Aft. 1940. She married WLLIAM STATEZNI 20 May 1916 in Detroit MI, son of GODFREY STATEZNI and AUGUSTA SCHESCKORSKY. He was born 09 Jul 1892 in Detroit MI, and died Aft. 1940.
i. WILLIAM W11 STATEZNI, b. Abt. 1917, MI; d. Aft. 1940.
ii. GEORGE EARL STATEZNI, b. Abt. 1918, MI; d. Aft. 1940. 25. EDITH A10 RICHARDSON (VICTORIA A9 BOLTON, FIDELIA WATERMAN8 TRAVERS, ELIJAH7 TRAVERS/TRAVIS, ELIJAH6, ASA5 TRAVIS, JOSEPH4, JAMES3, JAMES2, HENRY1) was born 29 Apr 1869 in Worcester MA, and died Aft. 1930. She married JOSEPH H HADLEY 17 Oct 1888 in Rutland MA, son of MARTIN HADLEY and MARIA HILDRETH. He was born Aug 1864 in MA, and died Aft. 1930.
i. HELEN A11 HADLEY, b. 03 Feb 1889, Holden MA; d. Aft. 1920.
ii. RUTH HILDRETH HADLEY, b. 15 Mar 1891, Princeton MA; d. Aft. 1920.
iii. MAUDE ESTHER HADLEY, b. 22 Nov 1895, Princeton MA; d. Aft. 1910.
iv. EDITH RICHARDSON HADLEY, b. 04 Jan 1897, Philliipton MA; d. Aft. 1920.
v. ALICE H HADLEY, b. Abt. 1900, Rutland MA; d. 29 Dec 1900, Rutland MA. vi. JOSEPH H HADLEY, b. Abt. 1904, MA; d. Aft. 1920. 26. ELMER EUGENE10 RICHARDSON (VICTORIA A9 BOLTON, FIDELIA WATERMAN8 TRAVERS, ELIJAH7 TRAVERS/TRAVIS, ELIJAH6, ASA5 TRAVIS, JOSEPH4, JAMES3, JAMES2, HENRY1) was born 29 Jun 1872 in Worcester MA, and died Aft. 1920. He married (1) SARAH MARY KEYES 15 Jun 1899 in Worcester MA, daughter of GEORGE KEYES and ELLA FALES. She was born 20 Mar 1875 in Worcester MA, and died 11 Apr 1913 in Worcester MA. He married (2) MABELLE G AGNEW 29 Nov 1913 in Worcester MA. She was born Abt. 1892 in MA, and died Aft. 1920.
i. MAE E11 RICHARDSON, b. Abt. 1901, CO; d. Aft. 1910.
ii. ARTHUR E RICHARDSON, b. 11 May 1903, Worcester MA; d. Aft. 1910.
iii. EDWARD E RICHARDSON, b. 18 Jun 1904, Worcester MA; d. Aft. 1920. 27. WALTER H10 RICHARDSON (VICTORIA A9 BOLTON, FIDELIA WATERMAN8 TRAVERS, ELIJAH7 TRAVERS/TRAVIS, ELIJAH6, ASA5 TRAVIS, JOSEPH4, JAMES3, JAMES2, HENRY1) was born Abt. 1874 in Holden MA, and died Aft. 1940. He married MARY S WARREN 12 Oct 1897 in Worcester MA, daughter of BERTHIER WARREN and EUNICE BOYDEN. She was born Abt. 1875 in MA, and died Aft. 1940.
i. BERTHIER W11 RICHARDSON, b. 20 Aug 1900, Worcester MA; d. Aft. 1930. 28. PAULINE DIANTHA10 TRAVERS (WILLIAM HENRY9, ELIJAH CLEMENT8, ELIJAH7 TRAVERS/TRAVIS, ELIJAH6, ASA5 TRAVIS, JOSEPH4, JAMES3, JAMES2, HENRY1) was born 03 May 1894 in Gardner MA, and died 08 Mar 1983 in Gardner MA. She married ARTHUR GUSTAV HEININGER, son of OSCAR HEININGER and BERTHA LEHMANN. He was born 29 Dec 1890 in Burlington VT, and died 30 Mar 1957 in Gardner MA. i. ARTHUR GUSTAV11 HEININGER, b. 26 Dec 1926, MA; d. Aug 1986, NYC. 29. GLADYS BELLOWS11 DURGIN (GEORGE F10, MARTHA E9 TRAVERS, GEORGE MARTIN8 TRAVERSE, ELIJAH7 TRAVERS/TRAVIS, ELIJAH6, ASA5 TRAVIS, JOSEPH4, JAMES3, JAMES2, HENRY1) was born 03 Jun 1884 in Concord NH, and died 09 Jan 1980 in Humbolt CA. She married CHARLES WALKER BROWN 08 Jun 1908 in Concord NH. He was born Abt. 1884 in NH, and died Aft. 1940.
i. CHARLES W12 BROWN, b. Abt. 1923, MA; d. Aft. 1940. 30. PHYLLIS11 RICE (MARY SUSAN10 DURGIN, MARTHA E9 TRAVERS, GEORGE MARTIN8 TRAVERSE, ELIJAH7 TRAVERS/TRAVIS, ELIJAH6, ASA5 TRAVIS, JOSEPH4, JAMES3, JAMES2, HENRY1) was born 02 Apr 1889 in Cambridge MA, and died Aft. 1940. She married CHARLES H MCKNIGHT 28 Dec 1915 in Lynn MA. He was born Abt. 1891 in Murfreesboro TN, and died Aft. 1940.
i. HUGH R12 MCKNIGHT, b. Abt. 1923, NY; d. Aft. 1940.
ii. AUDREY A MCKNIGHT, b. Abt. 1925, NY; d. Aft. 1940.